I would hold it against Mr. Costner that his film happened to the one that bested Martin Scorsese’s Goodfellas for Best Picture and Best Director in 1990. It’s a travesty, there’s no doubt about it. 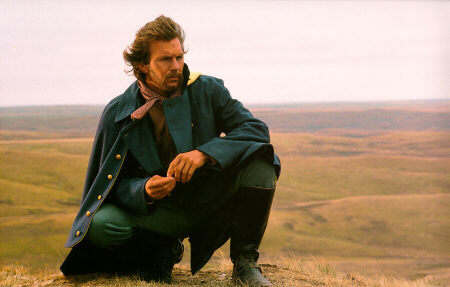 Though he’s proud of his awards, who knows Costner might even agree, but Dances With Wolves is not a bad because of it. In fact, these many years later, the multi-Oscar winning film is still a fine picture, elegant and moving romantic Western about the last days of the solitary Native American way of life before it was destroyed by white man's influence. In the new Blu-Ray edition we can only watch the lengthy 3 hour and 53min extended version, and so it literally took 4 or 5 sessions over three days to watch the entire film (difficult to do in one shot when you have kids). But I made it through, and was never bored. To remind, Costner plays John Dunbar a downtrodden soldier on the Union side of Civil War. He's sent to an outpost on the frontier, but when he arrives it's deserted, and thus left alone to his devices, waiting for his fellow soldiers to arrive. A tribe of Sioux Indians enters his world, a careful meeting at first which turns into a full fledged acceptance of Dunbar as one of their own. He learns all their customs and their language and even falls in love with a white girl (Stands With a Fist) living with the group since childhood. Dunbar knows the white man is coming and despite his position in the army he can't stop the inevitable. And so the film ends on a sombre reflection of these times now bygone, a new reality of a new world encroaching on the old. The near four hour running time in this extended edition is daunting, but in it’s compartmentalized segments never feels too long: There's John’s crisis and journey to the Fort; His time alone at the Fort; John meeting and getting to know the native tribe and the love story with Stands With a Fist. As director Costner shows a cinematic sense of grandeur, pathos, and a strong eye for composition and pacing. The celebrated buffalo hunt scene still is magnificent, like something David Lean would have directed. And this was a time before CGI, just using real buffalo and seamlessly blended practical effects (fake buffalo). His humane treatment of Native Americans is at times self-conscious, but considering the history of mistreatment by Hollywood, the egg shells he walks on is understandable. But Costner confidently walks this fine line with surprisingly minimal preachiness. I don’t remember how the original theatrical cut played but I recall a feeling that Costner's character was characterized as the saviour of the Sioux tribe he’s adopted into. In reality, in particular the battle with the rival tribe, Dunbar doesn’t so much save the tribe, but contribute to their victory. I had once complained about Avatar for this very thing, instead DWW is a more sophisticated treatment of this stranger in a strange land story. Costner shows grace, naturalism and resists strong urges to resort to Cameron’s base characterizations in order to simplify conflict. I guess this is what such heavy reliance on technology does - overwhelm human stories. At all times DWW is a human story. PS. It’s also a good time to celebrate the music of John Barry, who died this week. His fine score deservedly which won him an Oscar in addition to Costner's.